I had primarily been a third baseman in the parochial school in Amsterdam and at (Union) college. My first year in the minors was in 1948 at Nyack in Rockland County, in the North Atlantic League. I sat next to a kid at (Albany) law school who personally knew the owner of the Watertown franchise in the Border League. So I went up to Watertown for a tryout. They liked me, but their best player was their third baseman. There wasn’t much room for me, so they sent me down to Nyack. I think my salary was $150 a month. One day in ’48, I was playing third for Nack. Whitey Derle, who had played for Amsterdam in the Yankees’ organization, was our first baseman. The other team’s batter smacked a Baltimore chop towards third. It was a skin infield, hard as concrete, and the darn ball bounced so high, I lost it in the lights. I scrambled, picked it up, threw it to first, and still got the runner. Between innings, Derle said, “You’ve got a pretty good arm, kid. That ball you threw rose 6” comin’ over to first, and the speed was good too. You oughta try pitching.” I had a lot of respect for Whitey and took his words to heart. So during the summers of ’49 and ’50, I stayed home and played semi-pro ball in and around Amsterdam, learning how to be a pitcher. An old high school teammate of mine, Dutch Howlen, was coaching baseball at Manhattan College. Dutch knew Al Barilli and recommended me. The Glovers’ 1951 spring training was in, of all places, Mayfield. Who goes north for spring training? So I went to Mayfield, pitched batting practice, and made the team. If I remember right, my salary was $250 a month in Gloversville. Ironically, Dutch also ended up pitching briefly for the ’51 Glovers, as well. My first pitching appearance for the Glovers was at Kingston in relief. I came in and with one on and one out. The first batter walked on four pitches. The second hitter also walked on four pitches. Now the bases were full. I’d thrown eight pitches and still hadn’t thrown a strike. I guess I was nervous. So my second baseman came to the mound to calm me down. The next pitch was down the middle and the Kingston batter hit a real deep fly to left. My leftfielder, Pete Caniglia, caught it and pegged it home to get the runner trying to tag up and score from third. Inning over, no runs scored. We ended up winning the game. I believe it was our first win of the season. I went from goat to hero in an instant. That’s baseball for you. I had a couple more solid relief appearances, so Barilli put me in the starting rotation. Once I became a starter, I had an understanding with the team that I didn’t have to go to road games unless it was my turn to pitch. I had my own law practice and my wife and I were starting a family. So time was precious. If it was my turn to start on the road, I’d drive to the game and meet the team there, instead of taking the team bus. The team management was good to me that way. I got off to a nice start and had a 6-4 record. Then my wife Theresa got injured in an automobile accident. I took a leave from the club to care for her and our young son. That was it for me. I was never the same when I came back. I only won one more game after the leave and finished the year 7-10. The guys used to get on me because I gave up a lot of walks (93 bases on balls in 138 innings in 1951). “Your wild tonight, Sise.” But the truth is I had good control. I didn’t have much velocity. So I’d still be trying to paint the corners of the plate, even if I already had three balls in the count. That did result in walks, but it beat getting hit hard. I was always hesitant to throw down the middle because I didn’t have blazing speed. The history books have given Glovers Park the reputation of being a dilapidated place. But I don’t remember it that way. Glovers Park was a pretty good facility, certainly about as good as anything else in the Can-Am League, and better than most all of the ballparks I had played at in the North Atlantic League. The 1951 Glovers were a decent team. Good, but not great. Oneonta was the class of the league that year. By 1951, good major league affiliations were hard to come by and Oneonta had a great parent club in the Red Sox. They supplied Oneonta with some excellent players. Our best player in 1951 was left-handed third baseman Bill McMillan. I always felt that Bill had the talent to go far. I was certain that he was headed to the big leagues. But after the 1952 season, he got shot in the chest in a hunting accident and died. A crying shame! Our most popular player in 1951 was pitcher Al Barkus. He was a good man, well-liked by his teammates and the loved by the fans. Al worked in a glove mill, and the fans really identified with him. He was a knuckleballer. One time in 1951, Barkus started both ends of a doubleheader for us. I’ve heard that he did that once in 1950, as well. 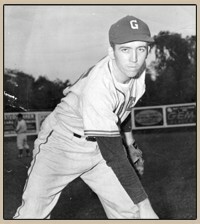 One of our better athletes on the ’51 Glovers was outfielder Walter “Silver” Slovenski. He had played both varsity football and varsity baseball for Syracuse University. Paul Wargo was probably the most accomplished pitcher on the ’51 Glovers. He had made it to the International League, one step below the majors, in 1946. By 1951 his career was winding down. But he was still very good. In ’46 with Rochester, Paul once struck out Jackie Robinson. That was his claim to fame. During the Jackie Robinson era, African-Americans were breaking baseball’s color barrier. I had two minority teammates on the Glovers, pitcher Walter James and shortstop Pedro Arroyo. I never saw any racism. There was no racial tension with my teammates, our opponents, or any of the fans. No discrimination whatsoever that I witnessed. Walter and Pedro fit right in.